This meal took less than 30 minutes to prepare. First, put the rice on with salt and olive oil. Just before plating I stirred chopped parsley into the cooked rice. 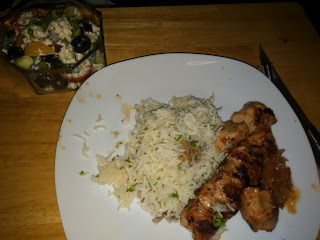 Pork souvlaki from Mitchell's just needs to be brushed with oil and BBQ'd for 3x3x3x3 minutes and medium high heat. Greek salad was tomatoes, red onion, cucumber, black olives, cow feta, parsley, salt, black pepper, olive oil and lemon juice. When I was plating I realized I forgot to buy sour cream for the souvlaki so decided to try Fern's spicy homemade ketchup. The sweetness was a bit odd at first but the heat helped and it tasted really good together with the souvlaki.